A sister publication of the Old Bailey Proceedings, the Ordinary’s Accounts, containing biographies of the prisoners executed at Tyburn, were regularly published during the century following the inception of the Old Bailey Proceedings. They are a valuable source of information about both elite attitudes towards criminality and the lives, attitudes, and dying behaviour of executed convicts. This website includes all surviving accounts relating to convicts tried at regular sessions of the Old Bailey court which were published under the name of the Ordinary of Newgate. If you know of any accounts which meet this criteria and are not included please contact us. The Ordinary of Newgate was the chaplain of Newgate prison, and it was his duty to provide spiritual care to prisoners who were condemned to death. One of the perquisites of the Ordinary's position was the right to publish an account of the prisoners’ last dying speeches and behaviour on the scaffold, together with stories of their lives and crimes. Sold at the affordable price of three or six pence, print runs ran into the thousands. As a result, this was a profitable sideline for the Ordinary, earning him up to £200 a year in the early eighteenth century. He published The Ordinary of Newgate's Account of the Behaviour, Confession and Dying Words of the Condemned Criminals... 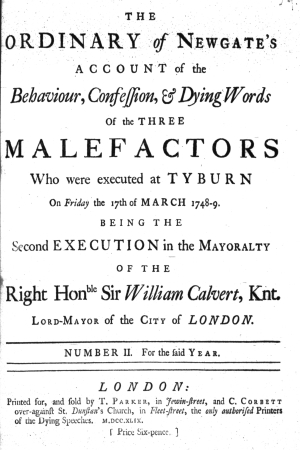 Executed at Tyburn (titles varied slightly) following almost every hanging day at Tyburn, and over 400 editions were published, containing biographies of some 2,500 executed criminals. Cover page: Ordinary's Account, March 1749. Most of the Accounts follow a similar format. They include a short summary of the names and crimes of those sentenced to death (including convicts subsequently reprieved), accounts of the Ordinary's sermon and his visits to the condemned prisoners, short biographical sketches of each criminal, and a description of their final confessions and behaviour at their executions. The earliest Accounts were compiled by Samuel Smith, Ordinary between 1676 and 1698, and from 1684 publication came under the control of the City of London. Early eighteenth-century Accounts compiled by Paul Lorrain (Ordinary between 1700 and 1719) often include advertisements, but these appeared less often in the 1720s. Between 1732 and 1744 under James Guthrie (Ordinary from 1734 to 1746) an “Appendix” was added, sometimes as long as 40 pages, containing additional material (such as correspondence) relating to the convicts. From 1745 both the sermon and the appendix were abandoned, with the former replaced with an essay, and more attention was focused on the crimes and trials of the condemned rather than their confessions. All known surviving Accounts are included in this website, and each is linked to the relevant trials. They may be searched by name and keyword, either separately or together with the Proceedings, or by using the Ordinary's Accounts by Date search page. Even more than other criminal biographies, the Accounts had the explicit moral purpose of teaching readers the wages of sin. The accounts of the convict's lives usually outline their descent down the slippery slope of immorality from minor delinquencies such as idleness and profaning the Sabbath into a life of crime. By rehearsing the sources of criminality the Ordinary demonstrated the dangers and temptations to sin faced by all men and women, including respectable readers of the Accounts. Not only did everyone face these dangers, but the Accounts showed that redemption was also available to all. By forcing the condemned to come to terms with their guilt and accept the ciourt's judgement passed upon them, the Ordinary attempted to reintegrate them back into the community. By confessing their crimes, and hopefully even providing details of accomplices who had not yet been captured, criminals could repay their debt to society and prepare themselves for salvation. While their lives served as salutory warnings, accounts of their deaths provided reassurance of God’s benevolence. The biographies of the condemned were shaped to give them an instructive moral. Nonetheless, research conducted by Peter Linebaugh indicates that most of the details of their lives in the Accounts, many of which could only have been provided by the convicts themselves, are reliable. These include their place and date of birth, occupation, religion, and account of crimes committed. The Ordinary did not alter significantly convicts' accounts of their lives and their explanations of their crimes. Because he sought both to entertain his readers and to show that convicts under his care were truly repentant, he had to allow them to speak in what was sometimes described (in order to validate their authenticity) as “almost in their own words”. While the Ordinaries occasionally criticised and sarcastically commented on these stories they nonetheless included them, because they formed part of the Ordinary's narrative of his bringing recalcitrant sinners to repentance. In telling their stories, convicts were able to introduce mitigating factors in justification of their crimes and even proclaim their innocence of the specific crime for which they were condemned, while always acknowledging their general sinfulness and sincere repentance. Although often printed in the third person, these texts provide a unique insight into the minds of eighteenth-century criminals. Not all convicts chose to cooperate with the Ordinary, whether because they were not Anglican or because they resented the fact that he would profit from their misery. But most did, because the Accounts gave them the opportunity to tell their side of the story, and to preserve what was left of their reputations from misrepresentation by others. For some, the Ordinary’s morality was dubious. Not only did he profit from the deaths of his charges, but there were allegations that the Ordinaries were corrupt, and only published the convicts' own words if they were suitably bribed, although we should note that these complaints typically came from the authors of competing accounts. Further competition came from ministers of other denominations, including Catholics, Jews and Methodists, who from 1735 were also able to counsel the condemned in Newgate. In plate 11 of William Hogarth's series of satirical prints, Industry and Idleness (1747), the Ordinary is depicted inside a coach near the centre of the image, between the cart carrying the condemned Tom Idle and the Tyburn scaffold. He is staring disconcertingly directly at the viewer from inside his coach, while the man who is actually ministering to Tom in the cart is a Methodist preacher. Reflecting the competition the Ordinary faced from other publishers who rushed to sell their own accounts, just below him in the forefront of the image is a woman who is already selling Tom's “last dying speech” before he has even reached the scaffold. In addition to increasing competition, in the 1760s the Ordinary had to cope with the decline of popular demand for this type of literature, and in the early 1770s the Accounts ceased to be published regularly, though the publication was occasionally revived for special cases. The related genre of the last dying speech continued to prosper, while criminal biographies were often collected in collections of notorious crimes such as The Newgate Calendar, first published in 1773. John Villette, Ordinary between 1774 and 1799 and publisher of the last example of this genre in 1777, compiled a similar collection, the four volume Annals of Newgate in 1776. These compilations, however, were mostly backward looking, containing famous cases from earlier periods, reflecting the fact that by the 1770s respectable readers were no longer interested in the lives of everyday criminals. Changing understandings of the causes of crime as well as shifting religious attitudes meant that the significance accorded to the words and behaviour of the condemned also declined. As Andrea McKenzie has argued, earlier ideas of the convicted criminal as “everyman”, whose experiences of sin and repentance provided useful instruction to readers and whose “last dying words” were a particular source of truth, had been replaced by the idea that criminals came from an intellectually and morally inferior class. By the last quarter of the eighteenth century respectable readers no longer found the Ordinary’s Accounts to be either instructive or entertaining.